We (Barun and his family &I) left for Howrah station and got down in front of Shipping corporation of India office (at Strand Road) and took the vessel (Rs 5 per head) to go to the station , to make it more interesting and more so, since we had ample time. At the station, we met Rajeev and his family. We took Mithila express (3.45 pm) to go to Raxaul (https://www.irctc.co.in/ ). Raxaul is on the Indian side. The scheduled time of arrival was 8 am and we reached at around 1.15 pm. We took Tonga/ horse cart (I went by a person’s bike as a pillion rider) to go to Birgunj (at Nepal), from where we booked a Tata Sumo to go to Kathmandu. There are no trains in Nepal. There are 5 main border crossings open to tourists from India. The Banbassa - Mahendrenagar border crossing in the extreme west of Nepal, is the closest to Delhi. The bahraich-Nepalganj border is the one closest to Lucknow. Nepal is a landlocked country between the Tibet autonomous region of China and India. It contains 8 of the world's 10 highest peaks, including Mount Everest - the world's tallest - on the border with Tibet and Lumbini, the birth place of Gautama Buddha. Nepal recently was declared a republic and has abolished the monarchy. Visas are available on arrival for citizens of most countries. SAARC nationals (like Indians) are exempt from visa fees. In fact we don’t need to take Passport even. But one is supposed to carry an identity proof. Kathmandu is the largest city and capital of Nepal . Once thought to be the inaccessible Shangri-La, Kathmandu is now a hub for a growing vacation spot catering to all budgets. The first thing some visitors notice about Kathmandu is the general lack of street names except for major roads such as Tri Devi & Ring Road (loops around the city) & address numbers. In most cases directions are given relative to the nearest Chowk or Tole (small road) or a noteworthy location or building (such as a temple or restaurant). It is possible to get around Kathmandu by foot, but it is not always a pleasant walk. Taxis are everywhere. Negotiate on a price before you get in a taxi . Prices go up after dark & in less busy areas. Taxis are easy to find; they park near all major streets & have fare-meters. After 10 pm it can be very difficult to find taxis away from central tourist areas or major hotels. It should be possible to hire a taxi for 300 NRs one-way to Patan & 800-1,200 NRs to Bakhtapur from Thamel or the airport. The meter is your best bet if you are not confident enough to negotiate. There are also buses for longer trips within the Kathmandu valley, i.e. Patan, Bakhtapur, Boudha, etc. that can be used for trips in & around around town. Blue buses & green buses constantly drive in circles/loops around the city on "Ring Road" - for 15 to 20 NRs - depending on the distance. Riding the buses with the local people can be interesting. The buses are typically very old and rough. Kathmandu's Tribhuvan International Airport is the largest, and only international airport in Nepal. Most flights to Kathmandu arrive via Delhi, gulf countries (UAE Qatar, and increasingly Bahrain), or Bangkok and of the remaining only a few originate from outside Asia. 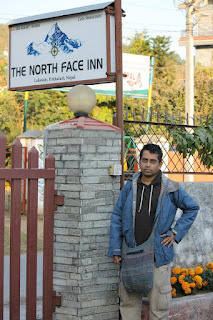 We reached our Kathmandu hotel at 9 pm at Bhagwan Bahal, North East of Thamel. We had our dinner at the only restaurant, we found open there. Since the restaurant was almost closed, we had to finish our dinner half full ! While searching for other restaurants, I bumped into a dance bar ! We heard Gangam Star song there! Luckily one Kashmiri restaurant was open near our hotel. We had some kebabs there. Next day we first went to Tri Devi temple (walking distance from our hotel). There are three temples inside the walled complex. We also planned to go to Garden of Dreams. But since the entry fee of this peaceful walled garden is NRs 200. (1 INR = 1.6 NR), we skipped it. The official exchange rate between India and Nepal is fixed ! There is no fluctuation. Then we had our coffee and breakfast at the classy Himalayan Java. We had Banana pancake. What I found very interesting is that everyone accepts Indian rupee and everyone keeps a calculator. They take both Rs 500 / Rs 1000 currency note (INR), both (Though they are not supposed to take Rs 500/Rs 1000 currency note ) and the balance is given in Nepali Rupee. Here you have to be used to IC or NC. IC means Indian currency .This is the term you will hear for rest of your journey in Nepal (if you are from India). 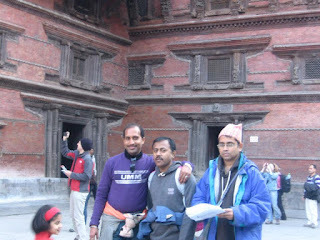 Almost everybody understands Hindi in Nepal, so we did not have any problem and we never felt we are outside India ! § Then we took a Taxi (Maruti 800 – fare NRs 200 per Car for a distance of 3 km) to go to Swayambhu Nath Temple ! A large stupa, highly revered in Nepal, and one of the most sacred Buddhist sites in the country. It offers great views over the city, and no lack of monkeys. It's a 20-30 minute walk from Thamel. 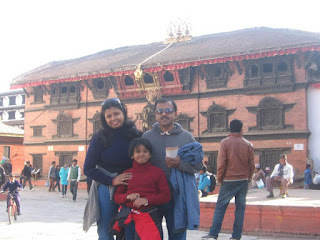 § Our next stop is (by a Taxi) to Kathmandu Durbar Square (fare Rs 200) for a 3 Km distance ! Kathmandu’s Durbar Square is one of three durbar (royal palace) squares in the Kathmandu Valley. "There are three durbar squares in the Kathmandu valley, all of them are quite similar and yet have individuality. Traditionally a durbar square used to be the residence of the king and also the center of the town. 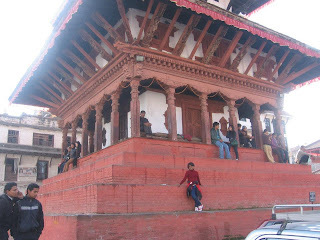 Basantpur Durbar Square is more popularly known as Hanumandhoka because of the large number of monkeys in this complex. 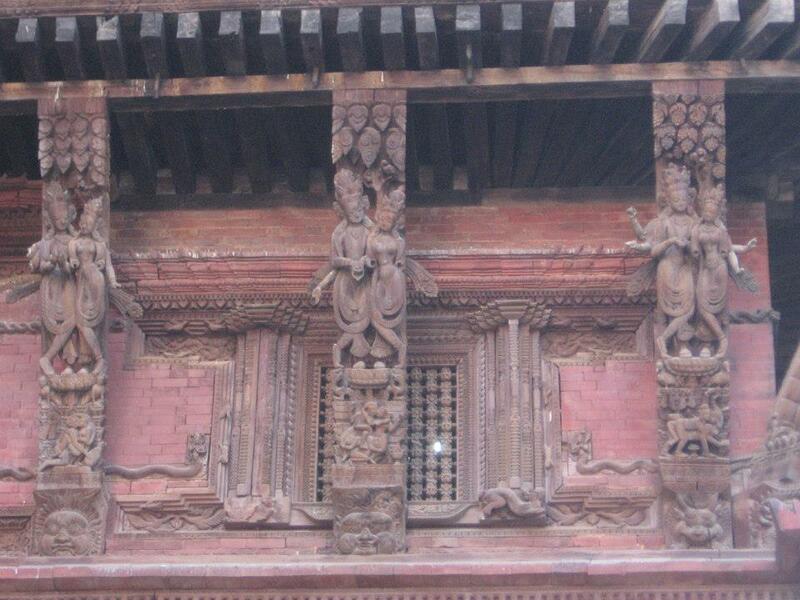 The other two are Patan and Bhaktapur. Bhaktapur is an old town and is considered the cultural capital of the region. This square actually has three squares. You see the first one as you enter from the main gate called the Durbar Square. 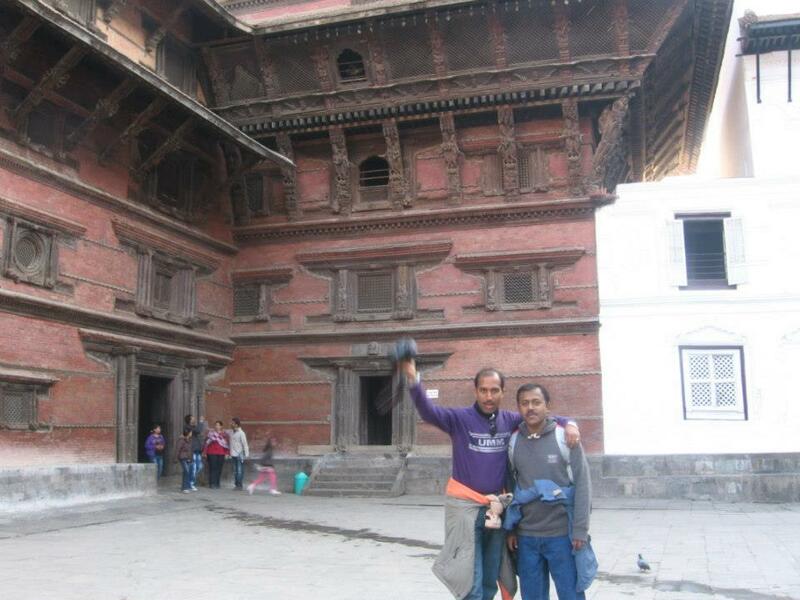 Patan Durbar Square is famous for it’s Krishna temple. It is built in grey stone in Nagar or North Indian temple architectural style and is a practicing temple. " It is the site of the Hanuman Dhoka Palace Complex, which was the royal nepalese residence until the 19th century and where important ceremonies, such as the coronation of the nepalese monarch, took place. 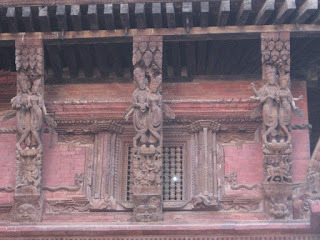 The palace is decorated with elaborately-carved wooden window and panels. 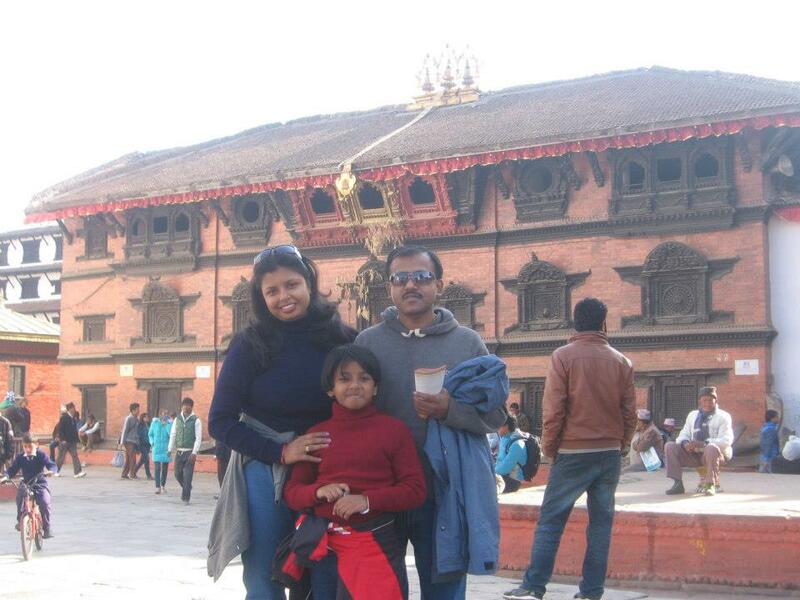 At the southern end of Durbar Square is one of the most curious attractions in Nepal, the Kumari Chowk. This gilded cage contains the Raj Kumari, a young girl, chosen through an ancient and mystical selection process, to become the human incarnation of the Hindu mother goddess. She is worshipped during religious festivals and makes public appearances at other times for a fee paid to her guards. The heart of the Kathmandu is this ancient square crowded with palaces & temples, including the current incarnation of the Kasthamandap or "Wooden house" that gives the city its name. The square has been in active use since the construction of a palace around 1000 AD. This site is the most popular UNESCO World Heritage Site in Nepal. Film "Durbar Square", poetic short movie directed by Guillaume Boulanger, 1996. § Taleju Temple One of the oldest temples in the square, this three-roofed temple with its pyramid shaped bases, is an example of the typical Newari architectural style. § Sweta Bhairab Statue shown only during the Indra Jatra festival. It is possible to climb the steps of many of the temples for a better look, or to join the people sat at the top watching the bustle below. The same palace holds the King Tribhuwan Memorial and the Mahendra Museum. It is also possible to visit the State Rooms inside the palace by paying a fee of 175 NRs. When we finished the tour of Durbar Square it is quite late for our lunch. Anyway we had some momos and Chinese food at the Freak Street. Freak Street is historic home of western hippies seeking enlightenment, but now just a few restaurants and hotels. What I find surprising is that almost all the restaurants sell chicken, mutton and buff (i.e. buffalo). Then we were back to our hotel, after marketing in Thamel. In fact by the time we finished our marketing we were almost back to Bhagwan Bahal. Next day we first went to Pashupatinath temple - Pashupatinath is one of the most sacred temples in the entire Hindu world. It is a sacred place where Hindus come (to die and) to be cremated. The temple of Pashupatinath is a large double roofed, gilt pagoda, decorated with brass, the gateway is plated with silver. There are images of Shiva along with other statues, shrines and temples dedicated to other deities in the complex. A circuit of the Pashupati area takes visitors past a sixth-century statue of the Buddha, an eight-century statue of Brahma the creator and numerous other temples. There are rows of Shiva shrines and Hindu pilgrims from all over south Asia offering ceremonies to worship Shiva, the Lord of Destruction. Entrance to the temple precinct is permitted to the Hindus only. However visitors can clearly see the temple and the activities performed in the temple premises from the eastern bank of the Bagmati River. Our next destination was Boudha Stupa. - one of the most sacred sites for Tibetan Buddhism. It is a must see in Kathmandu. We took a Micro Bus to go there . They are 10-12 seater with very fast service. This is largest stupa in Nepal and revered by both Tibetan and Newar Buddhist. The Tibetans believe, that the stupa contains the bone relics of the past Buddha Kashyapa. The colossal and ancient stupa of Bouddhanath is 36 meter high. We saw many Tibetans chanting matras, since there was a function around this time. At the ground level there is a brick wall and 108 images of the meditational Buddha inset behind copper prayer wheels. Early morning and evening are the times to visit Bouddha to join the local residents in Khora (walking the pilgrim’s circuit, sometimes with Tibetan pilgrims on their hands and knees). Kathmandu city itself has limited activities for visitors beyond the amazing sightseeing, but it is the starting point for numerous adventures in the rest of the country including trekking, rafting, jungle adventures and more extreme sports. 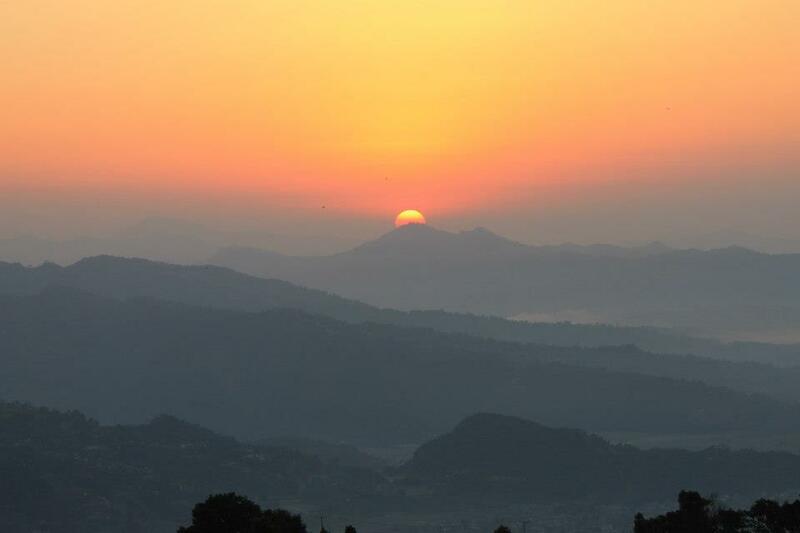 If you would like to see some of the Himalayas, but do not want to go on a trek, then Nagarkot, offers a great spot for watching surrounding mountain ranges at sunrise or sunset from atop the hill. You can still be rewarded with some great views of the mountains. 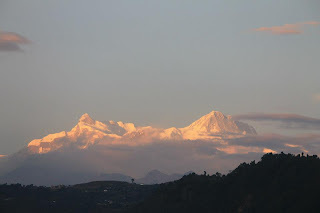 However later we thought if one goes to Sangarkot at Pokhara then one might skip Nagarkot. Nagarkot (altitude: 2,000 m) is approximately 30 kms away from Kathmandu by car. The Taxi took 3000 NRs. We took the Taxi in front of Boudnath. On the way back we got down at Bhaktapur Durbar square, which is apparently similar to Kathmandu and Patan Durbar square. But it was already dark and there was load shedding. In fact Kathmandu has around 12 hours of scheduled power cut or load shedding. Then we were back to our hotel after some shopping at Thamel. After dinner Barun and I went to see the casino at Malla. There are 5 casinos in Kathmandu. Some are there in Pokhara also. We mostly saw the Marwaris in the casino. However we did not play. On the first floor there is a dance bar and one skimpily dressed girl was dancing. The casino is in the ground floor. The most popular food in Kathmandu has to be Momo, a dumpling which has its roots in the Tibetan mountains. In a local place expect to pay 60 NPR for ten buffalo momos, 90-120 NPR in a tourist place. However, the prices vary according to what it is stuffed with. For example, Chicken momos cost more than a regular buffalo momos. Also a good place to sample local Newari dishes.A Nepali set meal will usually include rice, dal, vegetable/meat curry, a vegetable dish, chutney and curd. Expect to pay around 180-200 NRs at a tourist place, much less at local places. And NRs 300 for non-vegetarian food. Thamel - There are dozens of tourist restaurants clustered in the Thamel district serving everything from Middle Eastern to Mexican food. Coffee - Nepal is also a coffee producing country, though the people are famously tea drinkers. When ordering, try ordering "Strong coffee", as opposed to just "Coffee”. Expect your cappuccino to be anywhere from very little froth in large cup to something laced with whipped cream. Virtually all tourist accommodations are located in Thamel, near the Kathmandu Guesthouse. Upscale hotels tend to be a few blocks away on Durbar Marg near the former Royal Palace. A few guest houses still remain on Freak Street below Durbar Square, they tend to be somewhat cheaper, and a bit less well cared for than Thamel. We stayed in Bhagwan Bahal. Next day our bus will leaves for Pokhara. (Bus fare around 575 NRs). 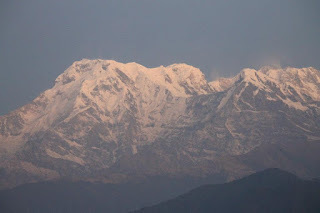 You must seat at the right side of the bus to see the breath-taking view of Himalaya. The bus to Pokhara takes 7-8 hours to cover the 200km. All the tourist buses now stop for lunch and snacks at prearranged restaurants. There are countless, extremely beautiful sights to be seen while looking out the side windows. Our bus left at 7.15 am. 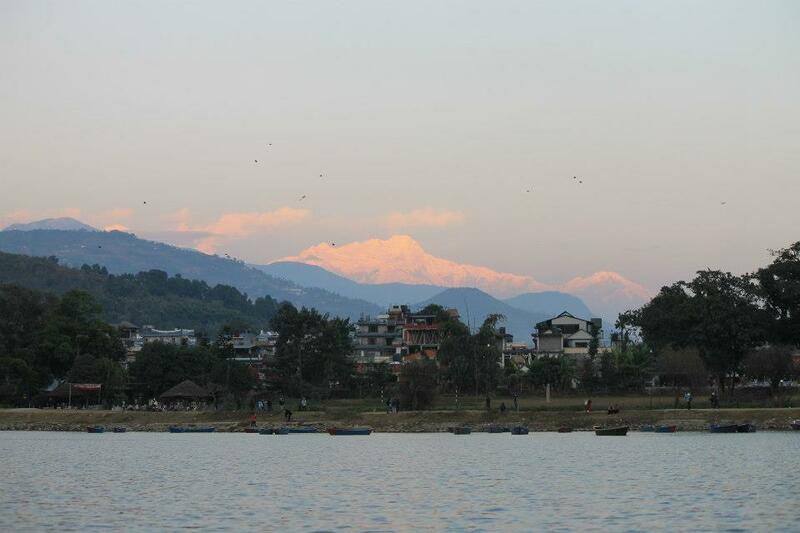 Pokhara is also a 30 minute flight, is a pleasant little city on a lake. They have the bonus of giving you a bird's eye view of the countryside and of the panoramic mountains themselves. Many visitors use it as a hub for treks, rafting trips and other adventure activities. There is also Chitwan National Park. Jungle low-lands of western Nepal are a popular place for safaris, complete with Elephant rides, rhino and tiger spotting, and jungle walks. The local microbuses leave Kathmandu for Pokhara almost every 15 minutes. These buses are available until late afternoon. It takes about 8 hours. Compared to the border town of Sunauli, if you can travel to the nearby town of Butwal, you will get more options for travelling to Pokhara. 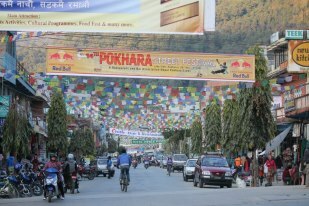 Pokhara is the third largest city in Nepal. 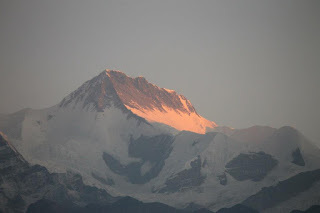 It is the starting point for most of the treks in the Annapurna area. It is considered by many to be the most beautiful place in the whole world. We were pleasantly surprised that our hotel owner picked us from the bus stop with their car and in the process we saved around NRs 500 ! We reached hotel around 4 pm. After freshening up we went to the Phewa lake for boating. Phewa Lake: One of the Nepal's most beautiful spots, Phewa Tal is surrounded by a combination of monkey-filled forests and the high white peaks. The reflections in the mirror-like water in the early mornings are something you must see at least once before you die. We hired a boat for 7 of us (365NRS) for an hour and rowed across the lake. The view of Annapurna from the lake is simply stunning! In fact we saw the sunset from the boat itself! Then we went for shopping and in the dinner we had some wonderful Thakali (Nepalese) cuisine. The other important cuisine of Nepal is Newari. It is possible to hire a bicycle in a lot of shops in Lakeside for a small price (NRs 100-200 a day). It is also possible to hire a scooter or a motorbike in Lakeside (from NRs 550+ a day - cheaper in Off-Season). You will have to buy petrol yourself (NRs 120 per litre and diesel price is NRs 80 ). It is not possible to reach Sarangkot or the World Peace Pagoda with automatic motorbike or scooter due to the steep uphill road. The cheapest food is found at the street stalls, selling Momo's (60 NRs, 10 pieces), Samosa (10 NRs each) or Fried noodles (50 NRs). Along the lakeside road, a variety of quality restaurants can be found. Virtually all tourist accommodation is located in Lakeside and Damside, near Phewa Lake. Yesterday we booked our car (Totyota Qualis type) by paying NRs 3000. We started the day with early morning sun rise at Sarangkot.. We left around 5.30 am. § Devis Falls, We first went to this falls. Spectacular and unusual, Devi falls plunge into a cave and disappear into the earth. We did some shopping too at this complex. § World Peace Pagoda (Shanti Stupa) We had to skip this stupa – from where one can have wonderful view of Phewa Lake , but the tour company was overcharging for that (NRs 1500 extra), we skipped it. In any case we had a ball at Sarangkot and cannot ask for anything more. § Then we left for Bat cave and Mahendra Cave . Chamare Gufa/Bat cave. 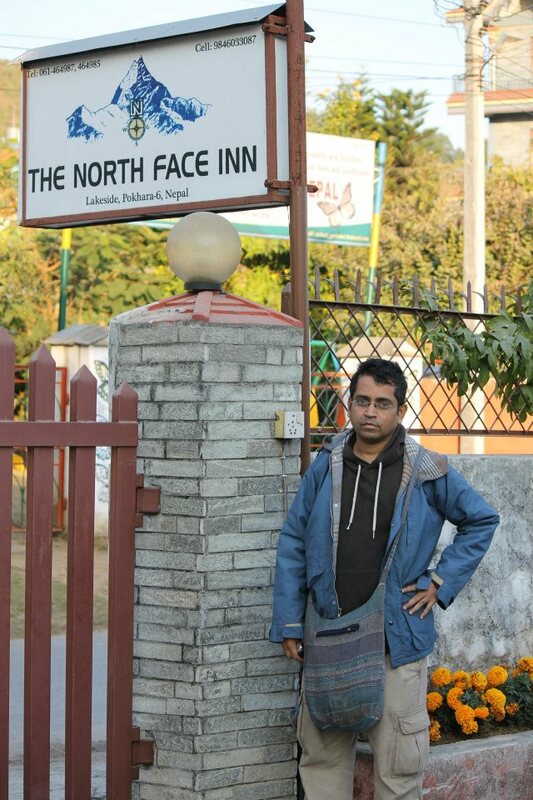 is located in Batulechaur, the northern end of the Pokhara city - some ten minutes away from the Mahendra cave. This cave is famous for the bats that can be seen hanging by the cave's walls. Bat cave was really a difficult climb and we had to retreat considering the fact we had two child with us. § Then we saw Seti Goge and finally Gurkha Memorial Museum, 08:00-16:30 everyday.The Museum dedicated to the famous soldiers from Nepal. You can observe here the various historic uniforms, their famous knifes and the different flags. NRs 150 for foreigners. NRs 80 for SAARC resident.Gurkha is a name of a place in Nepal. They were used as mercenaries and still they (few units) fight for British army and go to all over the globe the world for fighting. Many Nepalese people (Gurkhas) earn their pension from England. In fact we also learnt how the Gurkhas fought against Indian army. They are loyal to the employer like anything, even when many people revolted during Sepoy mutiny. It happened everywhere. I wrote in the comments book that brave and innocent gorkhas were taken for a ride by the British. Briith army uses the word Gurkha and Indian army uses the word gorkhas (may be the other way round) . The new Maoist government is trying to curb this practice of employing Gurkhas for British army. Buses to Kathmandu run from the bus depot starting at 07.30 every morning, and will arrive in Kathmandu sometime after 14:00. We left by a bus (to go to Birgunj), which left at 7 pm from a local bus station. Surprisingly there is no deluxe bus to go to Birgunj. We reached Birgunj at 3.15 am Neapli time i.e. 3.30 a.m. Indian time. The border at Raxaul opens at 5 am Nepali time. We left by taking a Tonga. We had to wait for some time, before the gate opened. Our train is at 10 am. Due to the fog the train left very late around 12.30 pm (because the train which comes from Howrah was late and the same train leaves from Raxaul). In the train we met a co-passenger who is coming back to India (Kolkata) after his short stint in Kathmandu , disillusioned. He is working in a pharmaceutical company. He has seen the regime of the king also. He said the corruption in Nepal has reached stratospheric level, which will put even Indians into shame. There is no Income Tax in Nepal. There is only VAT. The VAT paid to import Nano is 230% and for other cars it is 280%. That is why Taxi is prohibitively expensive. A Honda bike which cost 50,000 INR costs 300,000 NRS in Nepal. According to him flesh trade is the biggest trade there. Some of these information I have heard, while travelling in Nepal. Nepal with an area of 147,181 square kilometres and a population of approximately 27 million (and nearly 2 million absentee workers living abroad - I have seen Nepalese everywhere - in Laos, Thailand, Malaysia etc. They are also large numbers in Dubai), Nepal is the world's 93rd largest country by land mass and the 41st most populous country. (http://en.wikipedia.org/wiki/File:Population_density_map_of_nepal.png ). Some of the largest cities are Kathmandu,Pokhara, Lalitpur, Biratnagar, Bharatpur, Birgunj, Butwal, Janakpur , Hetauda, Bhaktapur. Hinduism is practised by about 81% of Nepalis, making it the country with the highest percentage of Hindu followers; Buddhism is linked historically with Nepal and is practised by 9%, Islam by 4.4%, Christianity 1.4%. Differences between Hindus and Buddhists have been minimal in Nepal due to the cultural and historical intermingling of Hindu and Buddhist beliefs. Morever traditionally Buddhism and Hinduism were never two distinct religions in the western sense of the word. In Nepal, the faiths share common temples and worship common deities. Among other natives of Nepal, those more influenced by Hinduism were the Magar, Sunwar, Limbu and Rai and the Gurkhas. Hindu influence is less prominent among the Gurung, Bhutia, and Thakali groups who employ Buddhist monks for their religious ceremonies. Nepal is commonly divided into 3 areas: Mountain, Hill and Terai. These ecological belts run east-west and are vertically intersected by Nepal's major, north to south flowing river systems.(http://en.wikipedia.org/wiki/File:Nepal_zones.svg). Nepal's diverse linguistic heritage evolved from four major language groups: Indo-Aryan, Tibeto-Burman, Mongolian and various indigenous languages. The major languages of Nepal are Nepali (48.6%), Maithili (11.7%), Bhojpuri (6.0%), Tharu (5.8%), Tamang (5.1%), Newar/Nepal Bhasa (3.2%), Magar (2.4%), Rai (2.8%), Awadhi (2.5%) etc. In addition, Nepal is home to at least four indigenous sign languages.Derived from Sanskrit, Nepali has roots in Sanskrit and is written in Devanagari script. 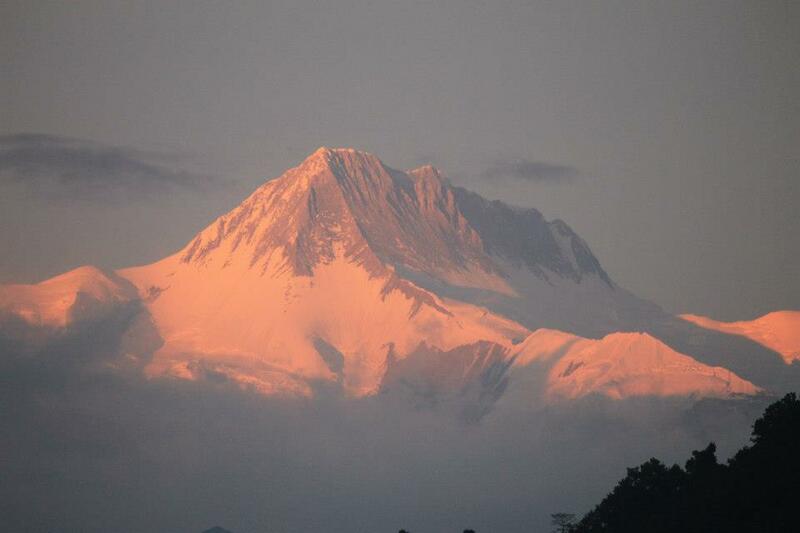 We hardly know the name of the 8 highest peaks of Neapl . They are 8,848 metres (29,029 ft) height Mount Everest (Sagarmatha in Nepali) , Lhotse, Makalu, Cho Oyu, Kanchenjunga, Dhaulagiri I, Annapurna I and Manaslu. (the whole list is here http://en.wikipedia.org/wiki/List_of_mountains_in_Nepal ). Technically, the south-east ridge on the Nepali side of the mountain is easier to climb; so, most climbers prefer to trek to Everest through Nepal. According to local legends a Hindu sage named "Ne" established himself in the valley of Kathmandu in prehistoric times and that the word "Nepal" came into existence as the place protected ("pala" in Sanskrit) by the sage "Ne". The word "Nepal" is believed by scholars to be derived from the word "Nepa:" which refers to the Newar Kingdom, the present day Kathmandu Valley. Nepal is first mentioned in the late Vedic text. Around 500 BC, small kingdoms and confederations of clans arose in the southern regions of Nepal. From one of these, the Shakya clan, arose a prince named Siddharta Gautama . In the early 12th century, leaders emerged in far western Nepal whose names ended with the Sanskrit suffix malla ("wrestler"). These kings consolidated their power and ruled over the next 200 years, until the kingdom splintered into two dozen petty states. However, in 1482 the region was divided into three kingdoms: Kathmandu, Patan, and Bhaktapur. In the mid-18th century, Prithvi Narayan Shah, a Gorkha king, set out to put together what would become present-day Nepal. Nepal was ruled by the Shah dynasty of kings from 1768, when Prithvi Narayan Shah unified its many small kingdoms.In 1788 the Nepalese overran Sikkim and sent a punitive raid into Tibet. However, a decade-long Civil War by the Communist Party of Nepal (Maoist) and several weeks of mass protests by all major political parties led to the 12 point agreement of 22 November 2005. The ensuing elections for the constituent assembly on 28 May 2008 overwhelmingly favoured the abolishment of the monarchy and the establishment of a federal democratic republic. Nepal's gross domestic product (GDP) for 2012 was estimated at over $17.921 billion, which is approx 1/70 th of India's GDP and less than 1/3 rd wealth of BIll Gates or 1/2 of Warren Buffett or less than net worth of ONE Mukesh Ambani as on 7.1.2013 !!! In 2010, agriculture accounted for 36.1%, services comprise 48.5%, and industry 15.4% of Nepal's GDP. While agriculture and industry is contracting, the contribution by service sector is increasing.